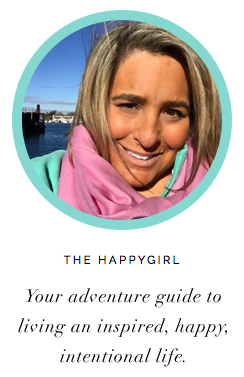 the happygirl: the adventure: surprise yoga! The email was simple. It said: "Be at our beach at 4pm." It was Christmas and our family was renting a house in Key Largo. Being spread out around the country, it's rare that we were all together but this week, these seven days were all ours to spend together. One night in November I was reading the Keys guide book and I stumbled on an activity that seemed perfect--yoga at your home. I called Kathy at Key Largo Yoga and immediately felt a connection with this chill, vibrant yogi. I asked if she could come out to our place in Key Largo. We talked for awhile and I mentioned there were three generations all coming together to celebrate not only Christmas but my mother-in-law's birthday. Could she somehow work that into the session? She loved the idea and we booked the session for Sunday at 4pm, just as the sun was setting. I told my husband L., about the session and we decided it would be fun if we surprised our family with this adventure. And so we sent the email and the guesses began. Then Sunday morning I got a call from Kathy. She was sick. Her whole family was sick and she couldn't come. She suggested a friend who was also a yoga master. I was disappointed because Kathy and I had talked a few times and I knew that she "got" the vibe we were going for but I also knew that everything really does happen exactly the way it is supposed to so I called the new yogi and spoke with Deanna. She had the same fantastic chill air about her and I knew that she too, would be perfect for what we wanted to achieve that afternoon. 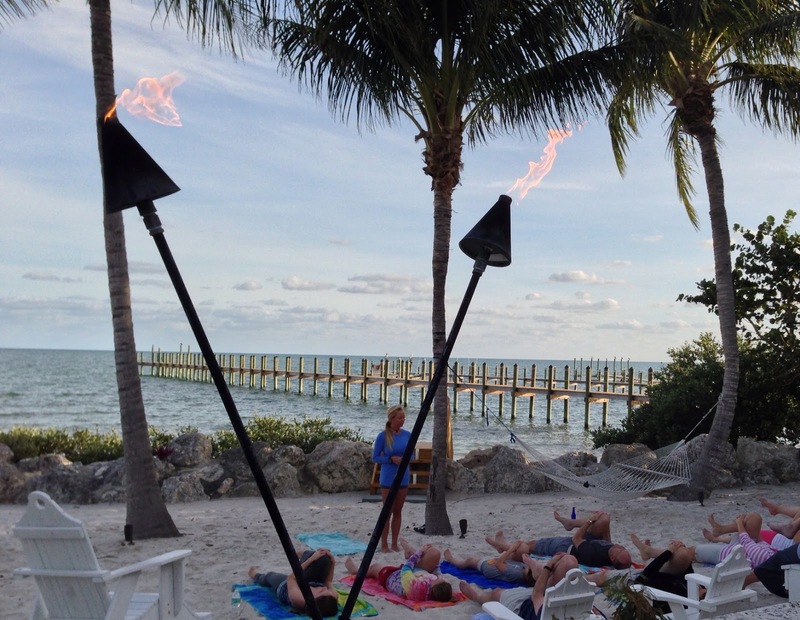 The boys lit the tiki torches around the pool and beach area. L. found some perfect beachy jazz and the outdoor area was flooded with music. The sun was just beginning to set and the palm trees were rustling in the soft breeze. I had let our 13 year-old niece in on the plan and she, her sister and their cousin brought down 11 beach towels and 12 bottles of water. Just as the family was starting to gather around the pool, this happy, lovely yogi arrived. I loved Deanna the minute I met her. She had the personality of someone who is living EXACTLY the life she wants to live. I knew this was the person we were meant to spend the afternoon with. It's funny how the universe works, isn't it? So here was this beautiful, fit, blonde woman standing with me as our family congregated by the pool. It was funny watching them assess why she was there. I let go and let her lead. She greeted us and told everyone who she was. There was laughter as our family told her what they thought the surprise would be. She led us out onto the soft sand with our beach towels and water and we began. I wasn't sure of everyone's experience with yoga so I had explained to Deanna that we would have three generations of varying fitness levels from grandparents to young girls. As Deanna started she showed how to modify the poses that could even be done by the least limber members. There were a few times during the session that I started to tear up. I looked at each member of my family as we stretched. I loved each person on that beach with me. The smell of the balmy sea breeze, the way the sky was turning pink and the warmth of the sand--each sensation felt magnified as we focused on holding each pose. As we held the final poses, I knew that this healthy surprise was a perfect way to say "We love you" to our family. Sometimes vacations can be an excuse to be unhealthy but this was a good way to focus on our bodies and health in a fun way. As a heartfelt final touch, Deanna presented a Namaste seashell to each couple and to each of the little ones. Throughout the week we would find these shells spread around the house and the outdoor area and it was a good reminder of a bonding moment in our family. This was such a fantastic adventure. We plan to incorporate a healthy activity like this in every vacation, whether it's a family hike or yoga or even a 5k run, this is great way to kick off a trip and put yourself in a happy mindset.